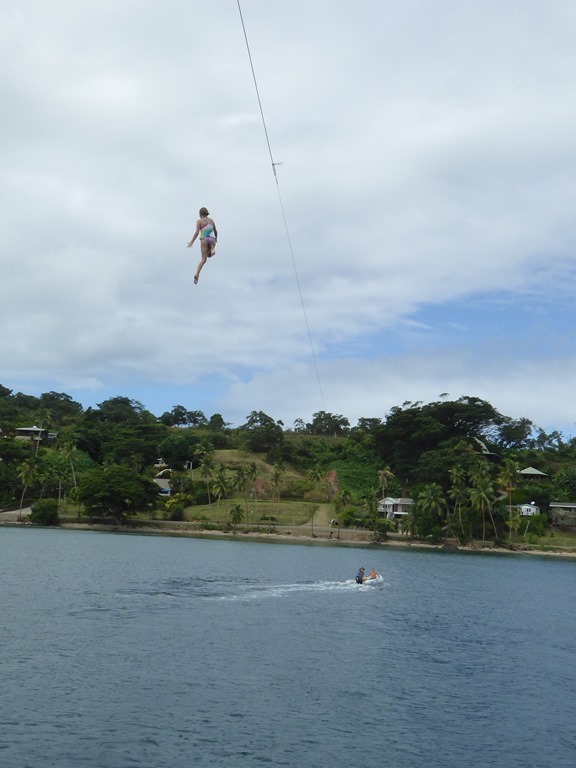 The sailing grounds of Fiji are huge and we will have the delight of exploring them for about two months. 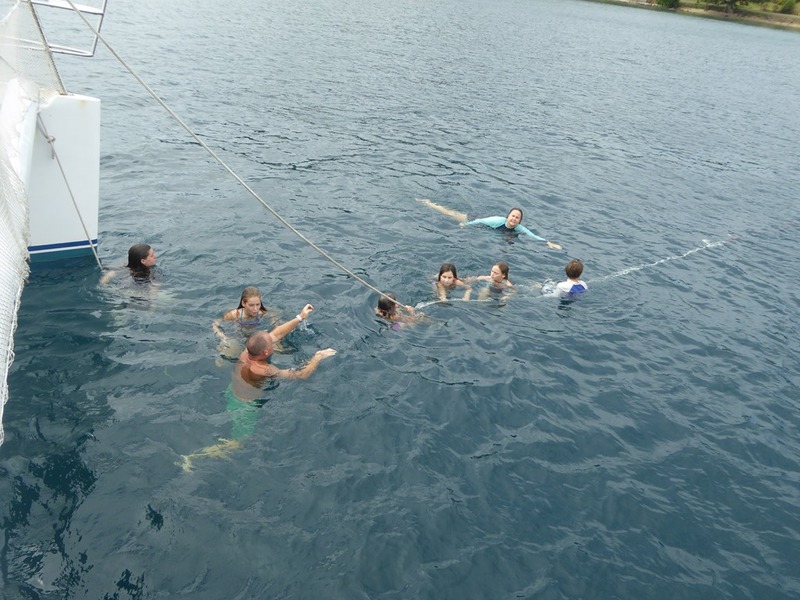 The Lau Group alone is over 200 miles long or half the length of the Caribbean. Then you have the Yasawa Group, two huge main islands and lots of other individual islands to explore. We decided we would explore as much as we could but with the primary goal of visiting the Lau Group, difficult to do unless the weather plays nice for you. These islands, very much off the beaten track and very definitely off grid, have only been opened up for cruisers to visit in the last five years. 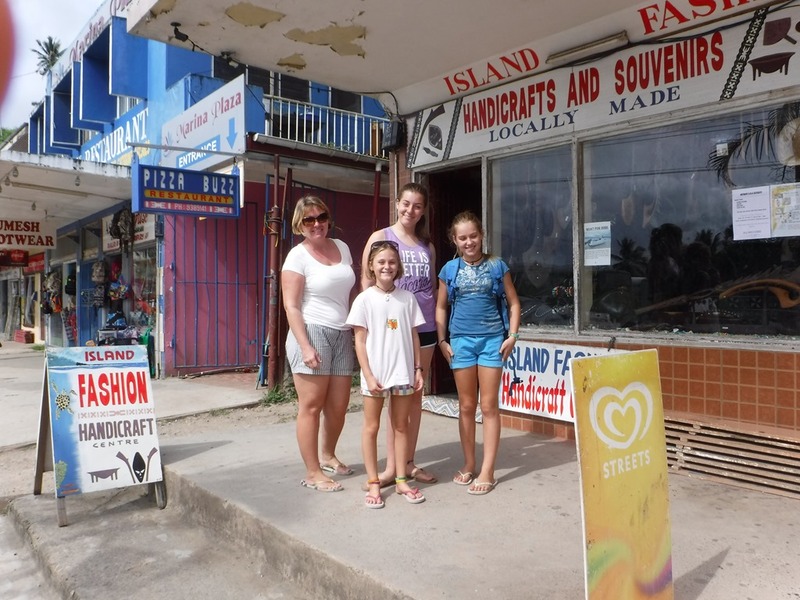 The Fijian Government stopped issuing permission in the mid 90s as it was felt that the island communities were being corrupted by the few visitors they were getting. Cruising licences were granted again in 2012. Last year around 100 yachts visited the chain. On our passage from Tonga, we came through the Oneata Pass during the night and then turned N for the 170miles run up to Savusavu. Our first sight of land in daylight was the island of Taveuni, a huge old volcano lying to the SE of our destination, Vanua Levu island. 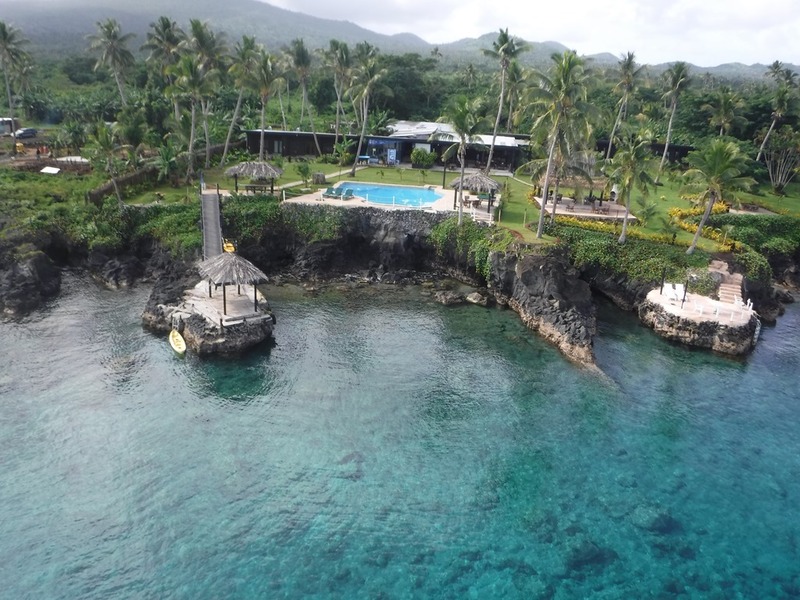 We booked in at Savusavu on Fri 9th Jun. 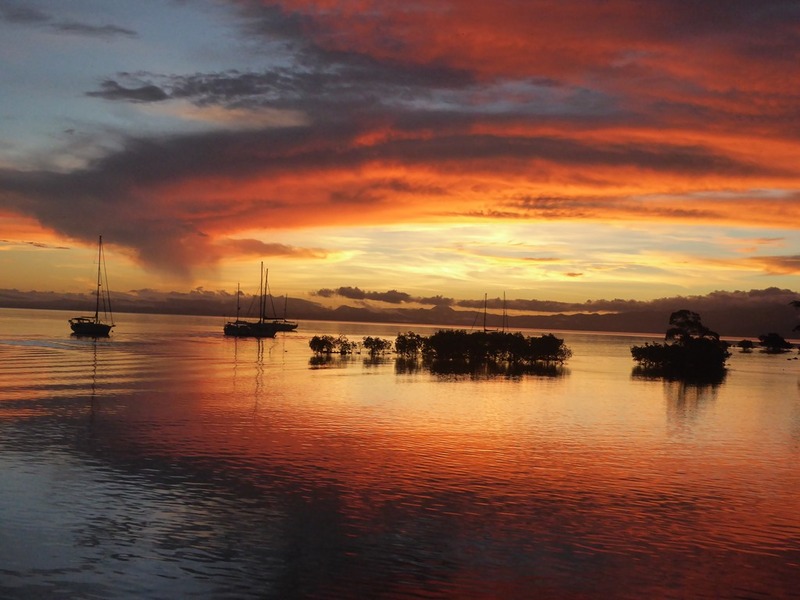 Savusavu is the northern and most eastern of the available booking in ports of Fiji. The Customs and Immigration Staff were pleasant and we had no problems. Charges are made for the Biosecurity and the Health inspectors (a total of about $230 – about £85 – exchange in Jun 17 was $2.70 to £1 – all pricing given in Fijian $). Don’t book in at a weekend as you get hit for automatic fees for the Customs and Immigration with a minimum charge of three hours staff costs, another $200 or so. The only issue we had was as we had no Fijian money on us, we needed to find their offices on the following Monday to pay. We had a few attempts where the staff were nowhere to be seen, presumably busy with duties but it did mean we explored the town well! 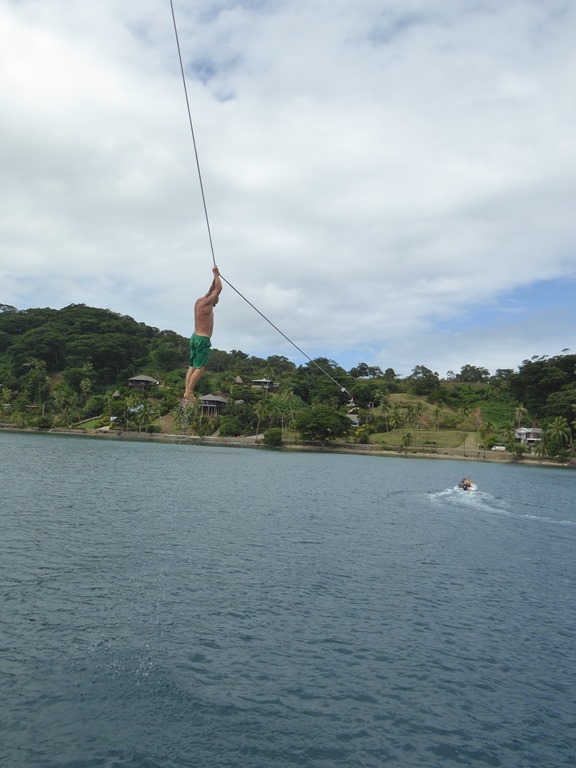 The other embuggerance we found is that until you gain your sailing licence you aren’t allowed to tour Fiji. Stupidly, it requires another application to the Customs staff after you have booked in. We did it through the Marina office and it took a further three days to be organised and for us to be called into the Customs office to finish the paperwork off, a total of a week after we arrived. Why it isn’t done automatically with the information you supply with your advance notice C2 paperwork, I don’t know. Once you have the licence, there is a second requirement to phone in to Customs with your plans once a week so they can track you as you go through the islands. We had a fantastic week at the Copra Shed Marina, sitting properly still for the first time after all the fast jumps we had had since Tahiti and met some good people. It took a few days to work out that we knew Ding from Opua when he had been parked beside ZigZag and we had mutual friends in Gill and Alastair of Starcharger. We had a good day watching Scotland beat the Aussies and then the Lions match afterwards. 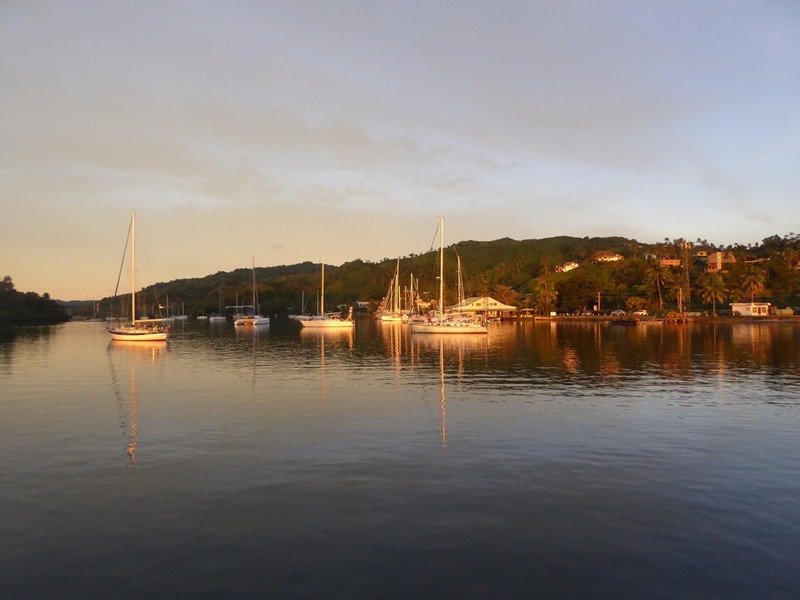 There are three marinas in Savusavu. You have the Yacht Club, a mile or so up E outside the town. 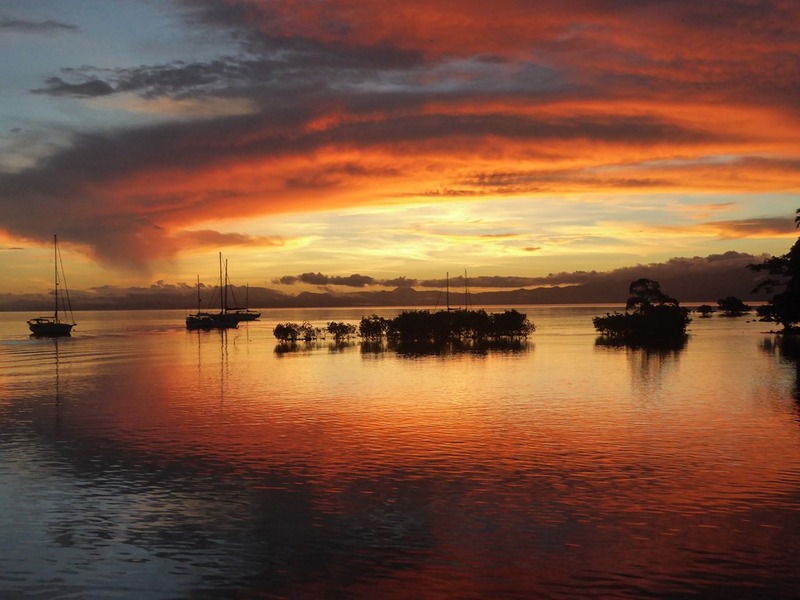 This is home to the long term liveaboards that have decided not to leave Fiji. We were invited down one evening for a pot luck supper which was great fun. They are a nice crowd. It was great to meet Jimmy, a 15yr vet of Fiji who has now qualified for residence. His story of building a platform on his newly gained land with an ISO container and putting a yurt up on top to live in until the house is finished is inspirational! Next you have the Copra Shed. With some dock space and plenty of balls, it is the most swept up and commercialised of the marinas. It has an excellent bar and restaurant, laundry, shops and a couple of chandleries with a surprisingly good selection. Their electronics were better priced than NZ. The marina will also organise, free of charge, your booking in and out, calling the Customs and Immigration staff in as you arrive. Well organised and with a secure dinghy dock, it is run by Geoff Taylor (the OCC PO in these parts) and his staff and is a good place to be. To point out a star, Pretty, the lady who runs the marina office is superb at sorting out your questions and problems. Our week on the ball cost us $15 a night and our evening view was fantastic. Lastly you have the Waitui Marina. These days it is pretty run down but its balls are even cheaper than the Copra Shed. If you really need to save cash go here, but don’t expect frills. It has a small dinghy dock, a bar and the evening restaurant is a BBQ stand at the front of the building. Saying that they are the best of the marinas at listening out on the radio and are excellent at sorting out taxis. Turning right out of the marina, there are several restaurants along the sea front. The Chinese is excellent (portion sizes are massive) and the Indian is pretty good too. You really need to ask for hot here as if you don’t you will get a bland offering. When they do heat it up, it is excellent. In regard to services, the Copra shed is excellent. Laundry is cheap at $8 a load and generally done within the day. Water and fuel are available (water from the dock at a small charge – fuel from the local Total petrol station – not tax free but easily organised). We wouldn’t recommend Shabnam, the lady who sits outside the Copra Shed and says she is a seamstress/sail repairer. She did some inside cushions for us on the basis we could check her work before we gave her our sail cover, parasail and bimini for repair. What came back didn’t impress and I certainly wasn’t going to hand anything more valuable to her to do given her standard of work. Internet is always a thorny problem in the Pacific. FP was stupidly expensive but we were impressed with Tonga. Fiji is even better. Fiji has an good 3G phone coverage and data cards for your phone cost $50 for 50Gb download, valid for a month from Vodaphone, the provider we were advised to use by locals. We bought a card and then a dongle to allow us both phone and data access. Full service and good internet about $140? And $50 credit for calls throw in for free? Excellent! Bizarrely international calls are $0.15 a minute, local calls are $0.42. 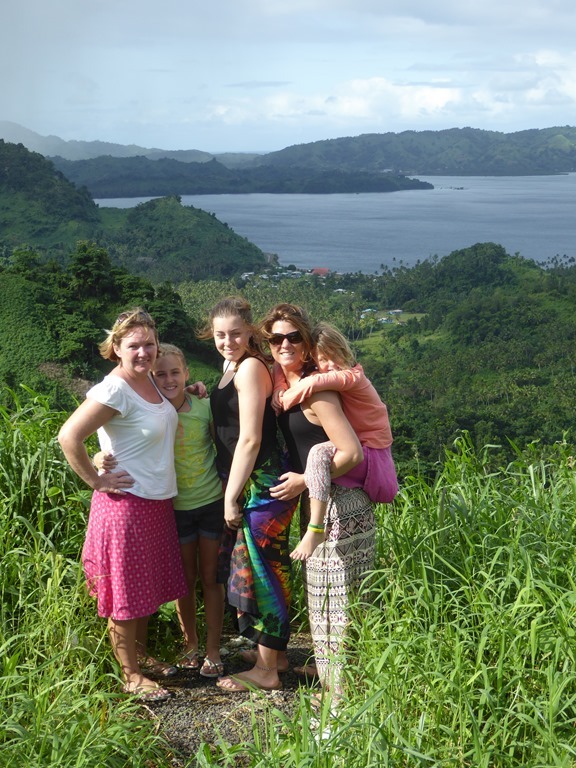 Go figure……..
We explored Savusavu thoroughly. It is a small town with one main street running maybe half a mile long with a bus station and a large indoor market for fruit, veg and the all important dried kava roots, used to make the local tropical beverage of choice. The majority of the shops are cheap, a bit chaotic but great fun to explore and the people are uniformly helpful and pleasant. It has been great to get back to better prices than FP. My Keen sandals were starting to fall apart. Fixed by the shoemaker for $6. Could have bought new flip flops for $5 but hey! It isn’t a population with much money and the pricing in shops (and you have to say the quality of goods in the shops) reflect this. Our first of four sets of Fiji guests arrived. 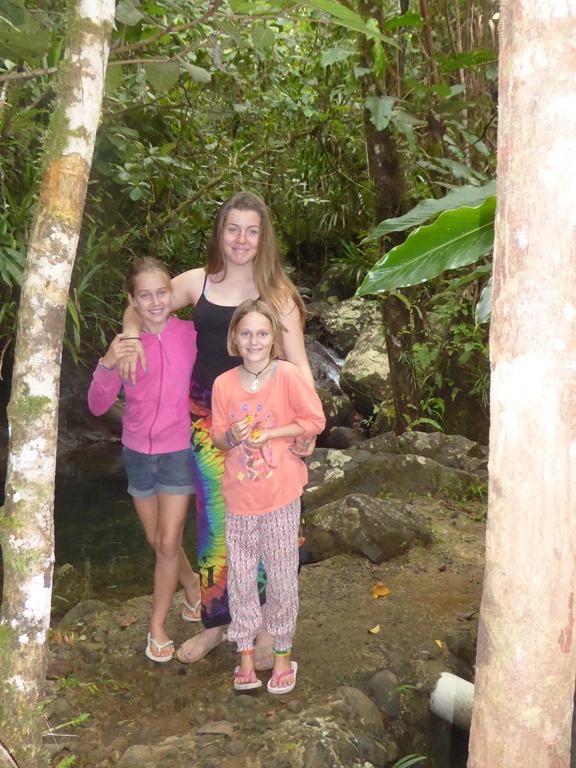 We last saw Shena and Kinsley from Almost There in Puerto Rico for Christmas ‘15 just before they moved off their boat and back to North Carolina. Kinsley has shot up and now is as tall as me at the grand old age of 13…. It was lovely to see both of them although the long flight out here had taken its toll. The goodies they brought out with them (new handheld, the new Delorme, new cable for the VHF and some god awfully sour sweets called Warheads for the girls) were gratefully received. The Moonshine that came too will be appreciated at a later date! 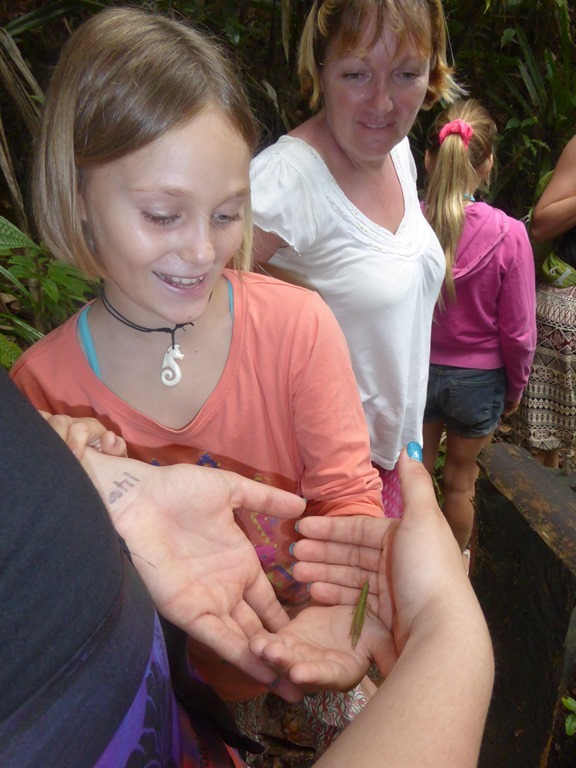 We had a couple of days exploring the local area with them.We visited a tropical rain forest, run by locals. 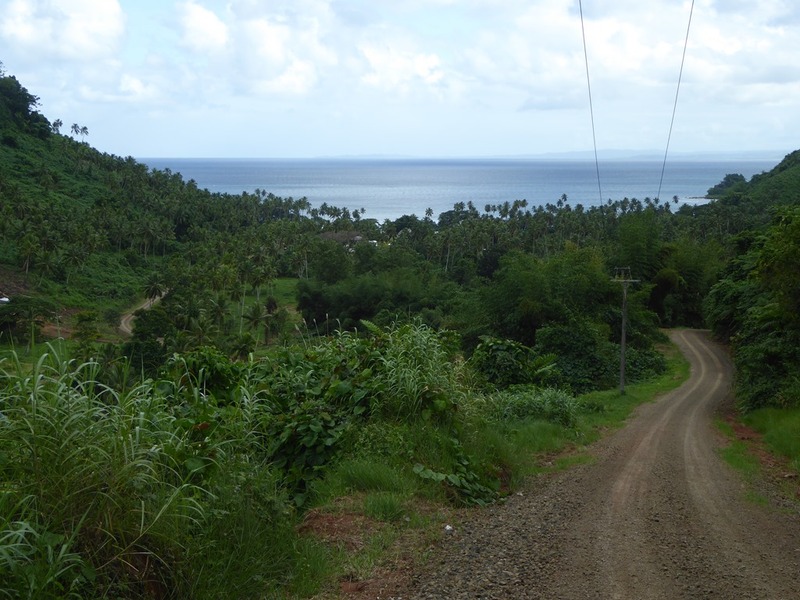 We spent more time looking for kava to present them and then getting stuck on the v small road to the village (thank you to the bloke who took pity on us and took us the rest of the way in his 4×4 – no way would our hire care have made it) than we did actually looking around the trail. 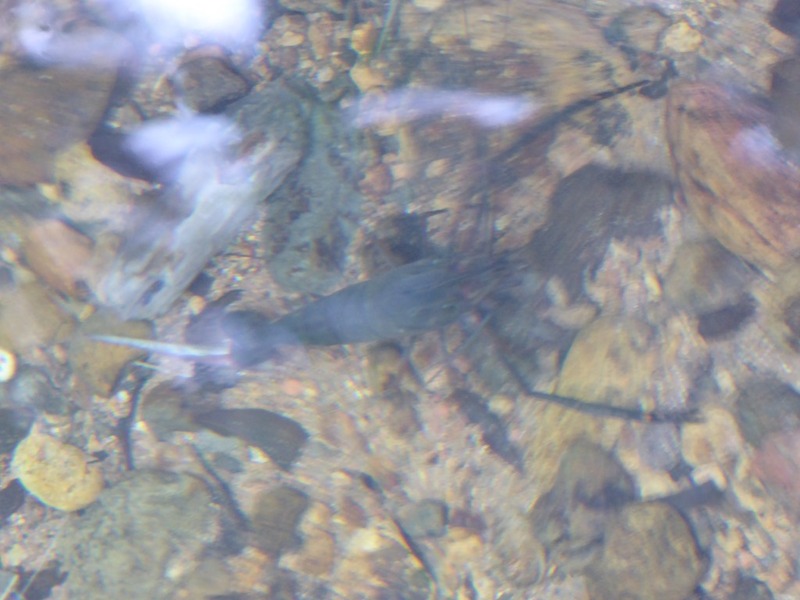 It is well worth a visit if for nothing more than the fresh water crayfish and the bugs we found. 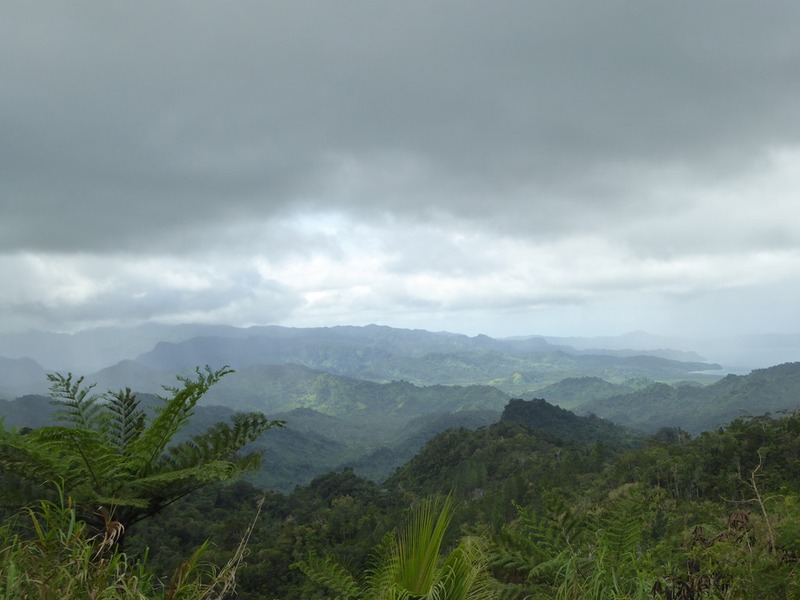 I enjoyed being surrounded by that slightly off rotten smell you get from true rain forest, very much a land smell. My legs didn’t really enjoy having to climb up and down hills for the first time in a long time. We visited a village that looks after a waterfall. 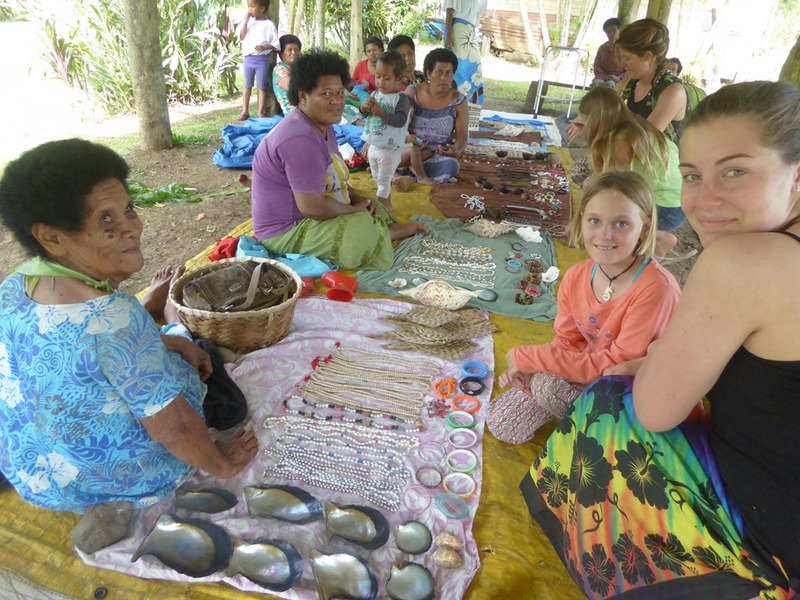 After our sevusevu ceremony where our $20 stick of kava root was formally accepted, we were given permission to look around the village, buy some trinkets made in the village and then visit their waterfall. I’m afraid I succumbed to the charms of an enormous shell and the ladies had fun buying bracelets. 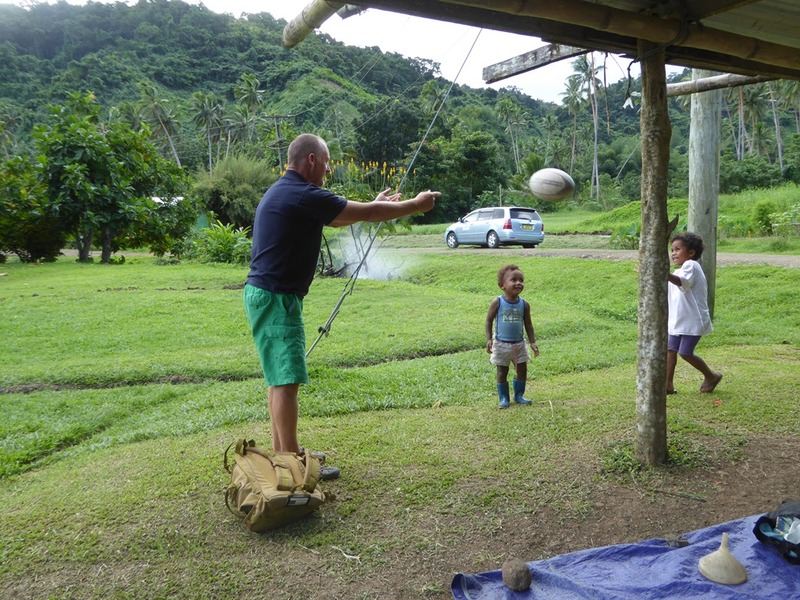 I had some fun with two very small boys wanting to throw a rugby ball around and we toured the neat, small village, proudly being show the church and the Fijian equivalent of the church bell, a hollowed out tree, used as a drum. We headed back into town and Lou got very excited about a sign she saw. 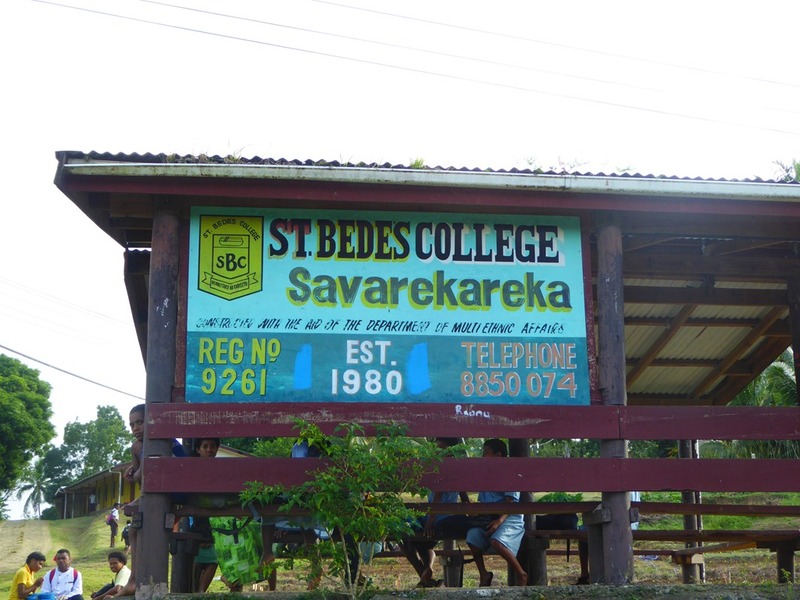 Apparently her Dad went to St Bedes when he was growing up………..
We met up with another couple of kid boats, Mrs Goodnight from GE with Katrina on board and most impressively Lil’ Explorers from USA with 6 kids on board! 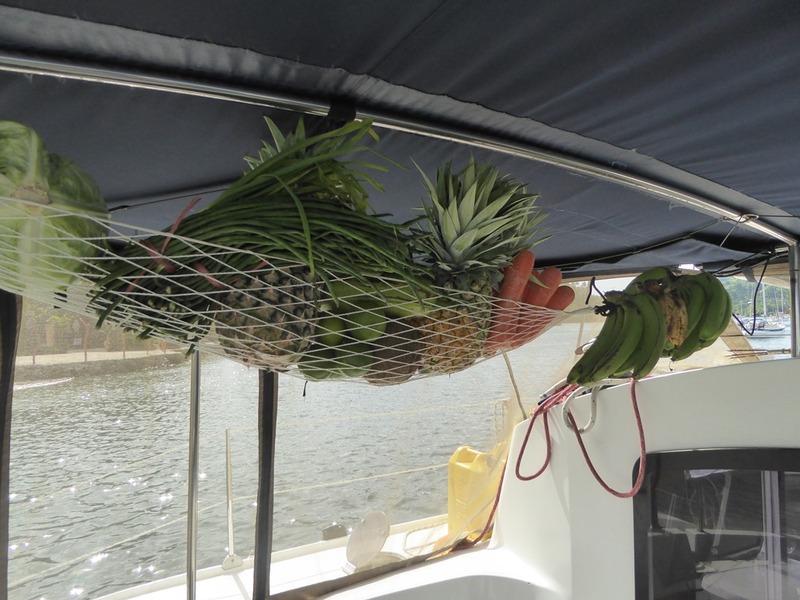 We loaded up with fresh from the excellent market as there is a very limited ability to pick up anything in the islands beyond the local’s hospitality. We moved from Savusavu SE to the end of the point beside the Jacque Cousteau Resort to meet up with Mrs Goodnight and Lil’ Explorers and to wait for a weather window to move to Taveuni, a large island 40miles W but well placed to give us a decent sailing angle down into the Lau Group, hopefully our next destination. Whilst we waited we had great fun with a movie night on board Lil’ Explorers and then an education for all of us in the delights of Halyarding. Great fun, a little scary and with the potential to go wrong if you mistime it, it was an adrenaline buzz loved by all. 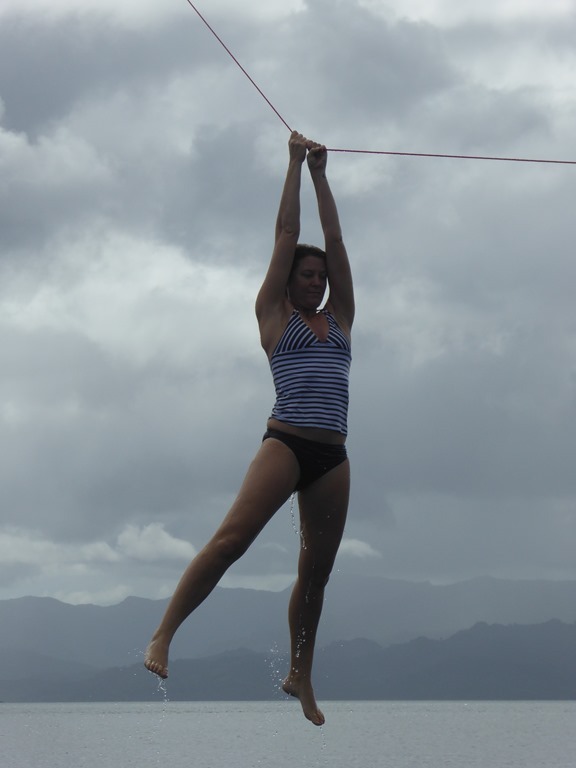 Shena and I got up to a fair height but the wee ones got to the full stretch of rope. 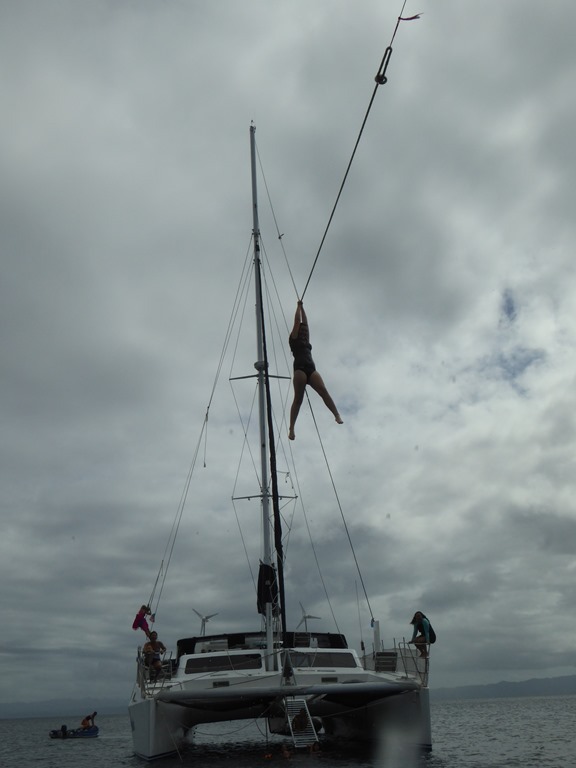 Hannah went one better and launched just as the rope went taut, firing above the line like an arrow. It took us all by surprise. 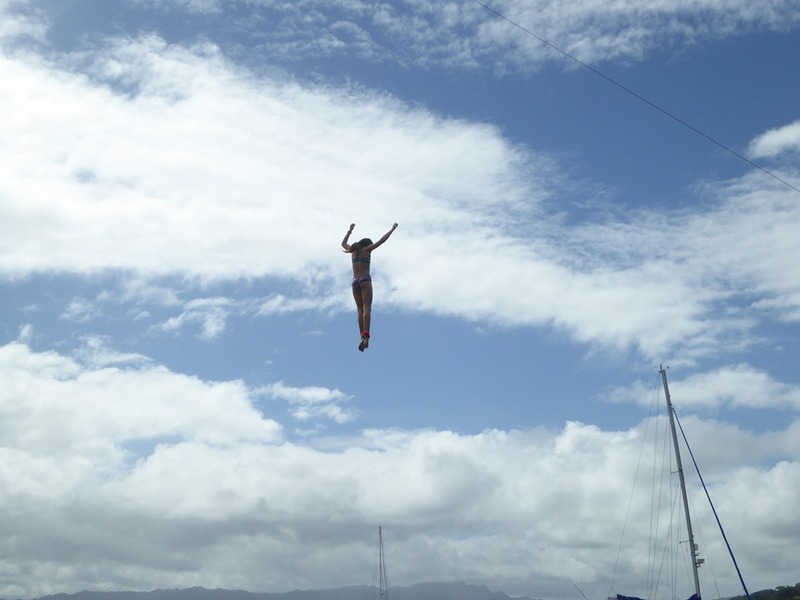 I think she reached well beyond 10m in height and took a long time to reach apex and fall back into the water! The passage to the Lau Islands is not an easy one. The prevailing winds of Fiji are the SE trades. 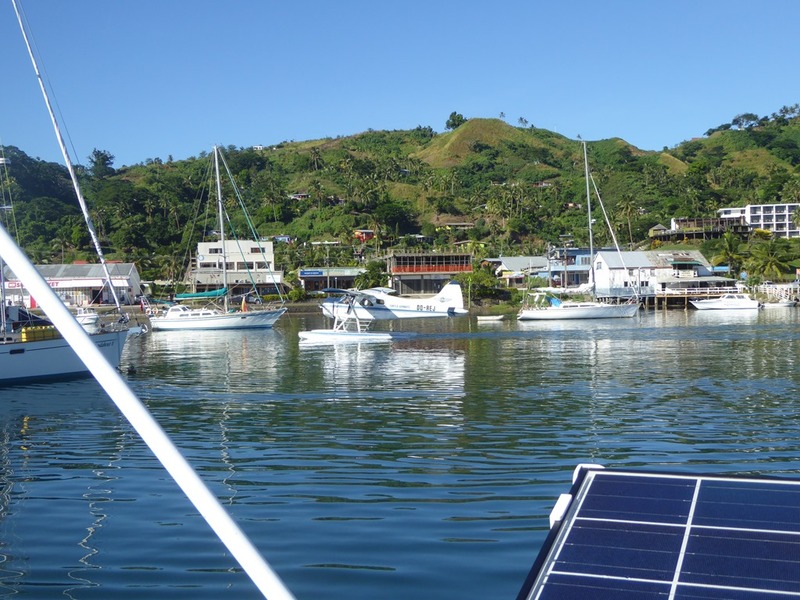 To get back into the Lau Islands from either Savusavu or Suva, the two booking in ports means a either a long beat upwind or waiting around for weeks to get a window of 36hrs or so when the Trades collapse as a system goes through. There had been one just as we arrived in Fiji and one looked likely as we moved around to the Jacque Cousteau Resort. 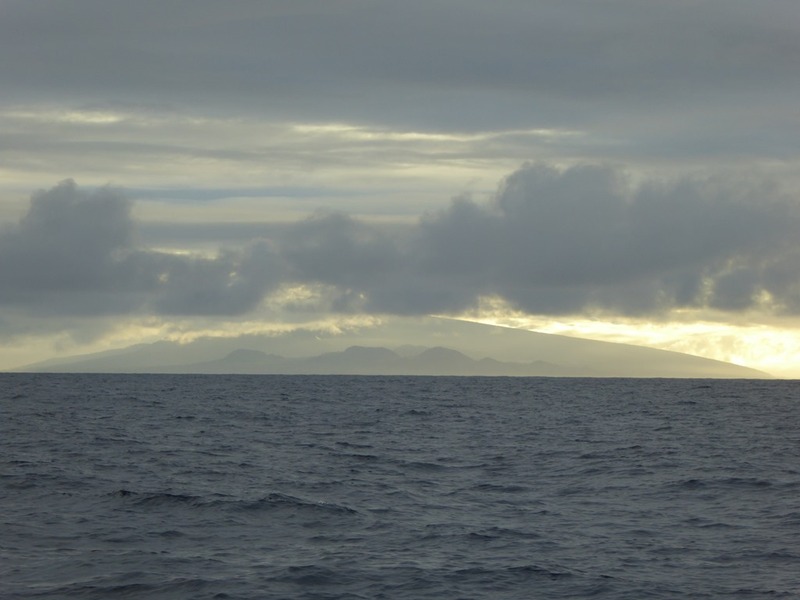 To position ourselves, we beat a further 40Nm E around to the island of Taveuni. 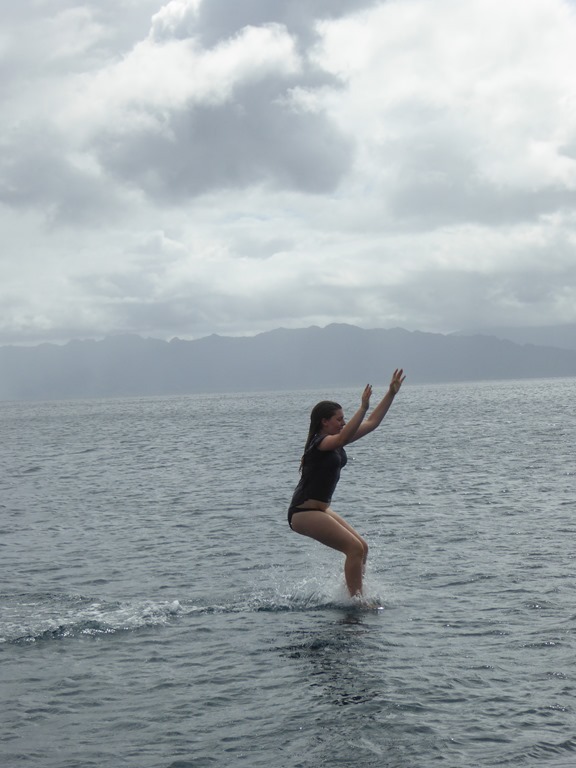 It was not a pleasant sail and we had big seas until we got into the lee of Taveuni. We stopped at the Paradise Resort near the S corner of the island and met back up with Stop Work Order. The resort is owned by two Aussies,Terri and Alan . 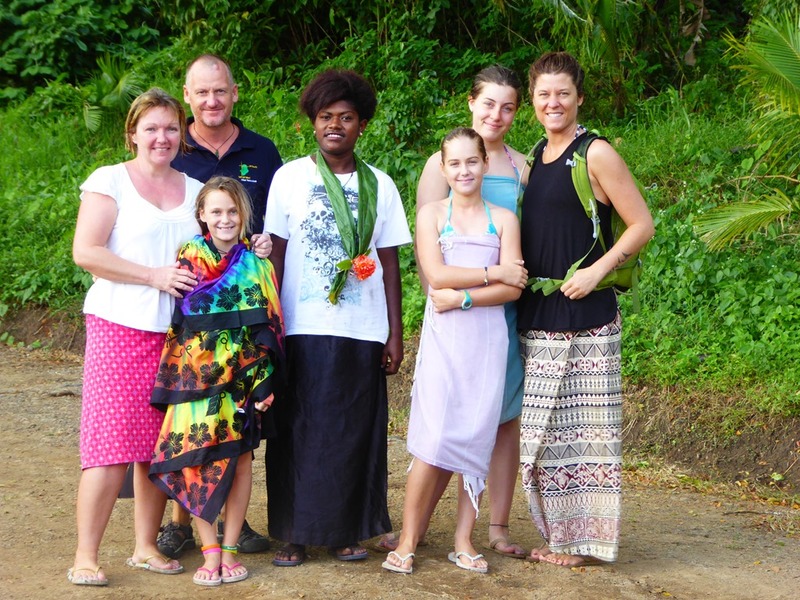 Deemed too old to do so in Aus, they moved to Fiji to be able to adopt kids and now have four happy smalls. Good people, they have decided the resort will be a cruiser friendly place and have put in 6 buoys in place for visiting boats. The buoys are free as is the use of the showers and pool. The food is excellent and the evening ambience, helped along by being serenaded by a guitar playing local was very pleasant. Internet is v expensive ($50 a day against $50 for 50Gb lasting a month via Vodaphone data card) as is laundry (more than 5x the price of getting it done at the Copra Shed) but we required neither service. I did get an education in wearing my “man skirt”. In FP, men wear the sulu with the front cover going to the right, just as I would wear a kilt. 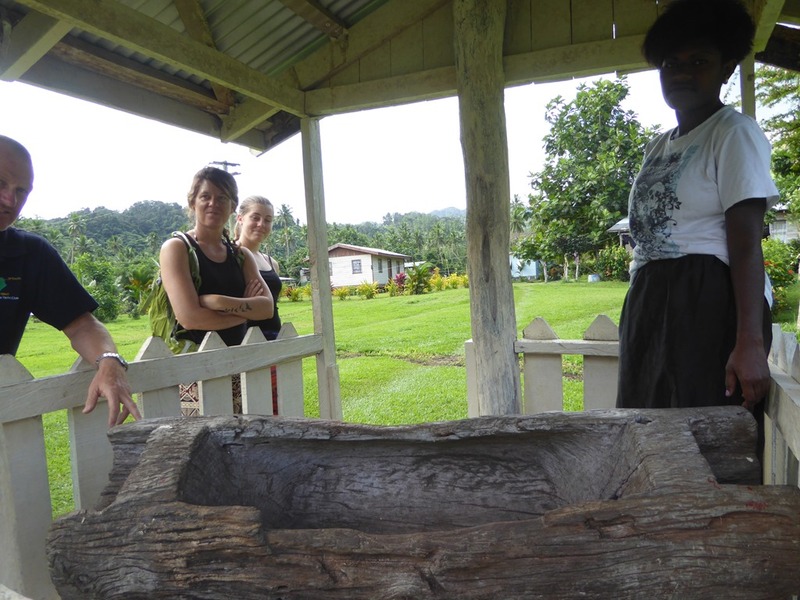 In Fiji, men wear the front cover to the left; ladies to the right. I was a little surprised to be wolf whistled at by the grinning guitar player but he explained why and we laughed. He did offer to exchange his own more formally correct Fiji suvu for mine but I rather like my Bora Bora flowery one…… I did change the wrap around before anyone else took advantage of me and got another knowing smile and a nod when he saw me correctly dressed! 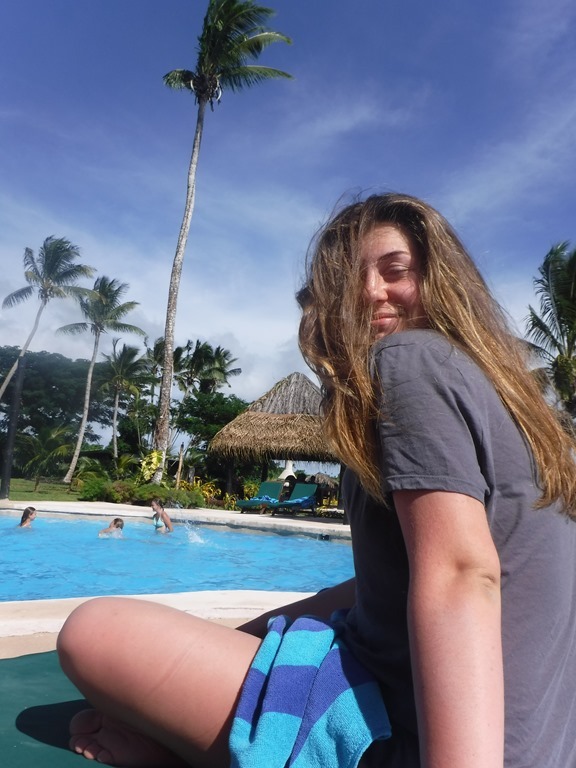 The kids had a wonderful time and Hannah enjoyed a couple of nights being invited to dinner with the Resort owner’s kids. Much laughter, great fun and we thank Terri for the invitations. 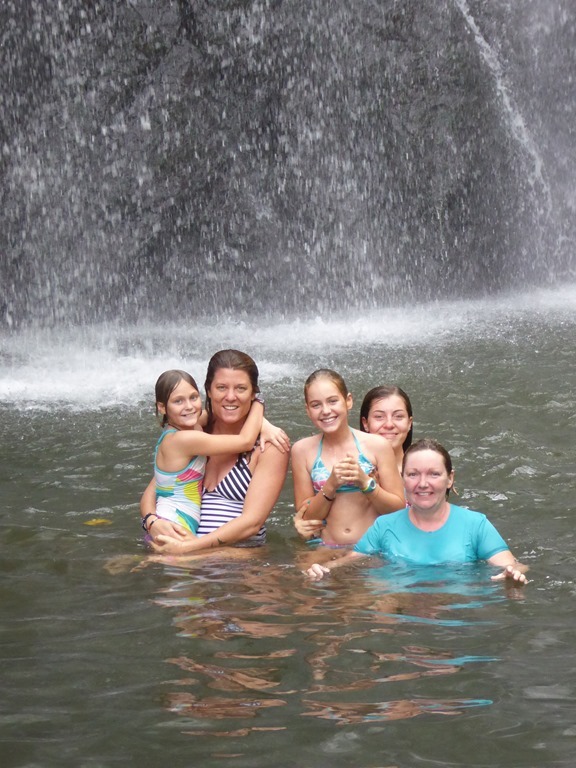 We had two great days at Paradise before leaving on the tide N to make more easting in the shadow of Taveuni. Two days of sailing stretched in front of us, most of it on a best course to windward.